It feels a little funny blogging here (the home for my introspective travel essays about the proverbial stranger in a strange land on an island in Brazil) about my new job writing for Yale Medicine Publications. I work in New England, in an office, at a desk from 9 to 5. I pack a lunch and eat it in the park, slipping out of my shoes and sitting tentatively on a park bench in the hope that the crease won’t fade from my starched slacks. Haven’t I become the antithesis of Another Island? I don’t think so. I’m happy. Finally fulfilling a goal that I once believed was unfairly eluding me, I’m writing full-time. (And eating a lot of my words as I sit at a desk in an office from 9 to 5 in my starched slacks – a prospect that I’m sure I’d have called a death sentence in past writing, in a past life). And in a major plot twist, I’m writing about science. But all of my writing is travel writing, the journey from New York to Floripa in 2007 just a leg of the trip, and here begins another. I arrived in New Haven on a Thursday and had to cover my first story that Saturday. Naturally, I was terrified, so it seemed only fitting that my assignment took place in a tiny dark room full of hundred-year-old jarred brains: The Cushing Center, two floors below Yale medical library, is a mini-museum for the Cushing collection. 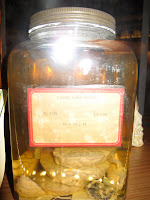 Yale inherited in 1939 a collection of brains and brain tumors – 650 of them – in jars, when Harvey Cushing, Yale professor of neuroscience and in fact The Inventor of Modern Neurosurgery, passed away. He kept the tumors and the brains of each of his patients, not trusting them to anyone but himself after a nurse had misplaced a specimen early in Cushing’s career. On his death, Cushing left this collection to Yale under the condition that they would find a home for it. Until the Center opened two weeks ago, the brains stayed in the basement of the medical school for more than 70 years, where medical students – in a med school rite of passage – broke in to view them. The students signed a poster that read “Leave only your name. Take only memories,” making them members of The Brain Society. Cushing was also a gifted artist. He left skillful surgical illustrations, drawings from his travels, and – my favorite part of the exhibit – stunning black and white photographs of his patients. About 10,000 glass plate negatives in all were piled in the basement with the brains. The images depict late-19th and early 20th century men, women and children, many with visible brain tumors. Shaved or partially shaved heads reveal bulging skulls or indentations from where skulls had been cut away to relieve the pressure of the tumor. The expressions on the faces – sometimes those of laughing children, or fearful adults – reveal only humanity. In most of the images, patients splay a hand across their chest or next to their face. The hands were examined as a means of brain tumor diagnosis. An overwhelming number of those tumors beneath the protruding skulls of the photographs were successfully removed, restoring the lives of the women, men and children pictured, and those tumors are now in jars along shelves of the Cushing Center. When Cushing first started practicing, the mortality rate for brain surgery was 30-50%. He brought that rate down below ten. His techniques are used in modern operating rooms today. And now, pieces of his surgeries, performed a hundred years ago, can be seen in a tiny dark room beneath the library. This is so fascinating! Sounds like you've gotten such an interesting job, Sonya, one that really fits you so well. I'm happy for you! Will you send links to your articles? Will they be online I hope? You make brains and brain surgery as entertaining as travel. I'm so glad the blog is back.